Cell potency refers to how specialised a cell is and its ability to differentiate; create other cell types. At the moment of conception, a stem cell is made. This stem cell has the ability to divide to create more cells and these cells differentiate and become more and more specialised as the germ layers are formed, giving each cell a dedicated role to create, in our case, a human baby. Germ layers are three layers of cells formed in the early stages of embryonic development. This simplified account of the germ layers will provide you with a very basic understanding of their structure. The ectoderm refers to the outside of the body, skin and nerves etc. The mesoderm refers to the middle layers of the body; bones, fat and cartilage. The endoderm refers to the inside of the body; the gut, muscle and lungs etc. How is Cell Potency Described? Totipotent cells have the greatest ability of all to differentiate. They can create any cell in the human body including cells to create placental tissue. 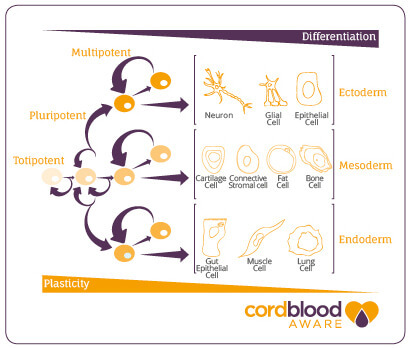 Pluripotent cells are highly specialised cells which have the ability to create any cell type in the human body except cells to create placental tissue. Multipotent cells are more specialised stem cells. Their ability to differentiate is restricted to one tissue type. For example; a haematopoietic stem cell can only create other haematopoietic stem cells, red blood cells, white blood cells and platelets. Haematopoietic (HSCs) Stem Cells are found in the mesoderm. Unipotent cells are not stem cells and they do not have the ability to create other cell types. These cell types only have the ability to self-replicate. For example; a red blood cell only has the capacity to create another red blood cell and cannot create a white blood cell.